Maia from Kumarah Yoga joins us today to share with us how we can all introduce our children to yoga and lead our kids through a simple yoga sequence that’s perfect for children as a morning yoga routine or to relax them ready for bedtime. Kids have a lot going on these days. They are surrounded by technology, inundated by busyness, and don’t often engage in physical activities as often as we’d like. Many kids are stressed out from having big responsibilities, too much homework, and from the amount of information available to them that their little minds just can’t quite handle. We need to make sure we carve out time in the day for our kids (or students!) to let go of those worries and stressors. They need time to play, relax, and to focus on their bodies and how they feel. They need time to tune IN and be reflective about themselves. Yoga (and mindfulness!) is an excellent tool to help kids destress, find simple pleasure in movement, and pay attention to themselves in a way that video games and social media don’t allow for. Doing a yoga sequence, a series of yoga poses linked together with breathing, is one of the most effective ways to get all of the benefits of yoga in a short amount of time. You get kids crossing the midline, breathing and being mindful, and using core strength all in one. It is a great idea to help your kids wake up and get some energy right away in the morning, and also to help them calm down and relax a little before bed. The wonderful thing about yoga is that when you do it consistently, your body takes what it needs from the practice. If the body needs energy, yoga helps invigorate you, if it needs to settle down, yoga brings a slower heart rate. Yoga and attention to breath brings balance. If you have not done yoga with your kids or students before, make sure to prep them and let them know why yoga is good for us. It helps our muscles stay strong and flexible, it helps us learn to breathe deeply and have good posture, and it also focuses our mind. 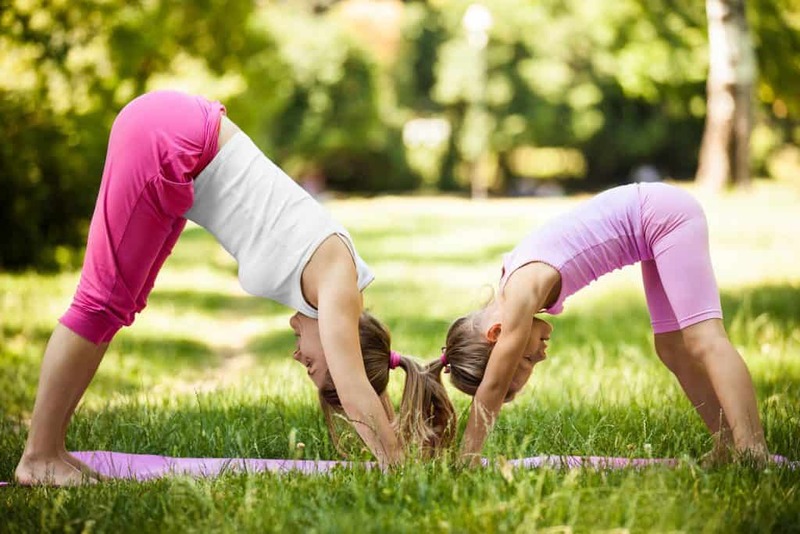 Learn some more tips for teaching yoga to kids here. Also, if you are just starting, make sure you join in and do the yoga with your kids. Or, just start a practice on your own and help them get interested and make the choice to join as well! Encourage creativity by coming up with poses that match animals or things in nature. It’s ok to even let them come up with poses to match their favorite movie or video game characters! 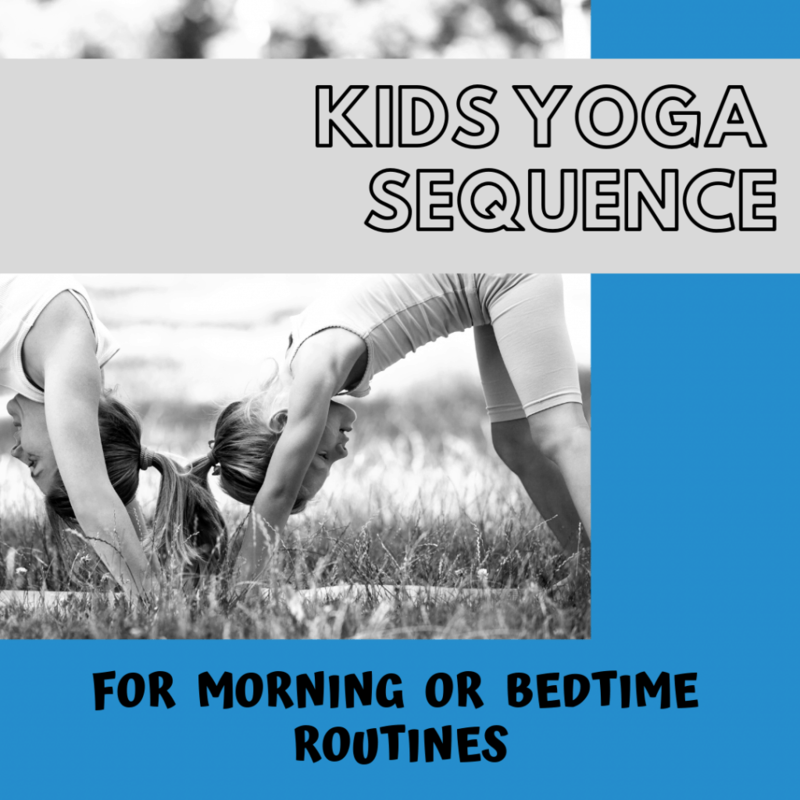 Here is an example sequence that you can try with kids, along with a free printable that takes you through the routine and includes illustrations of each pose. Breathe slowly for at least 5 breaths for each pose. Mountain pose (or house, or tower): Stand tall with your feet together and back straight. Squeeze your legs together and reach your arms up toward the sky to become a tall mountain! Crescent moon (or kite): Clasp your hands together over your head and reach up and over to the right. Lengthen your side body and make a moon shape. Breathe in and go back up. Exhale and reach to the other side. Forward fold (or ragdoll, or waterfall): Gently release your hands, bend your knees a little, and fold all the way forward. Rest your hands on your legs or the floor and gently let your head hang down. Plank pose (could be a pirate ship plank or a blimp or… you decide! ): Walk your hands out towards the top of your mat so your body is in a straight line. Squeeze your legs in and your tummy to your spine. Look forward just a little to keep your back straight. Baby shark (or superhero with hands released): Lower all the way down to your tummy and reach your hands behind you. Clasp them behind your back like a fin, squeeze your legs together like a tail, and lift your shoulders up. Wiggle back and forth like a shark! Down dog (or tent, pyramid, or unicorn! ): Press your hands into the mat and lift your hips up and back. Lengthen your spine so your back is straight, bending your knees a little if you need to. Warrior one (or archer, goddess, or superhero): Step one foot forward up next to your hands. Bend your front knee and keep your back leg straight. Reach your arms up to the sky and stand proud and strong. Warrior two (or surfer): Keeping your legs the same, rotate your shoulders and hips to the side, reaching your arms out away from you and parallel to the ground. Look forward and breathe! Tree pose: Step your feet together and stand straight and tall with your hands at your heart. Lift one foot up to rest on your ankle, calf, or thigh. Reach your arms up and stand tall like a tree! Eagle pose (or koala): Bring your arms out in front of you, tucking one elbow under the other, bending your elbows and reaching for your palms. Then bend your knees deeply and cross one leg over the other, balancing on one foot or resting your other toes on the ground. Squeeze everything in to balance! Use these poses with breath to help wake up in the morning, or settle down before bed. After doing the sequence, sit down crisscross back to back or in a circle (with a large group). Close your eyes and listen to your breathing. Notice how it feels to connect to your breath and see how long you can sit quietly. Use a singing bowl or special bell if you need something else to focus on. Then, give yourself (or kids!) a big hug and smile and keep on being awesome! I hope this sequence helps you and your kids in any part of the day. 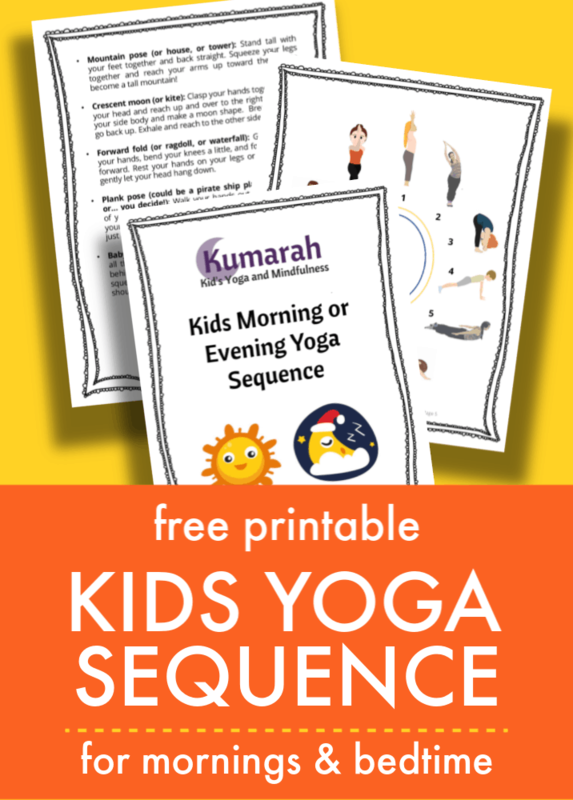 For more kids yoga resources, including games, printables (including a printable version of this routine), and lesson plans, you can access the Kumarah Free Resources Library here. For more kids yoga sequences, check out this article: Kid’s Yoga Sequences that Keep Kids Engaged. Also, check out my Kid’s Yoga Poses for an Amazing Yoga Flow with 22 poses, images and descriptions, plus tons of tips for teaching!